Grafenberg, August 26, 2015. Automotive, aerospace, marine, machine construction, wind energy – the range of applications for which RAKU-TOOL® products are used is extensive. This will be reflected by the large variety of exhibits on show at the booth of RAMPF Tooling Solutions at Composites Europe 2015 – hall 3, booth B04 – from 22. – 24. September in Stuttgart, Germany. Over 400 hp, a top speed close to 290 km/h, acceleration from 0 to 100 km/h in less than 3.0 seconds – the GP3/16 racing car from Italian chassis manufacturer Dallara Automobili not only impresses with raw power and driving performance, but also with excellent handling characteristics. For the production of the car, analogous requirements had to be fulfilled: maximum speed on the one hand, high-class product characteristics on the other. These criteria were fully met by RAKU-TOOL® Close Contour products, which were used for the manufacture of prepreg lay-up tools for the monocoque of GP3/16. For the main monocoque body, RAKU-TOOL® Close Contour Casting CC/CB-6503 was used for the production of master models for prepreg lay-up tools. RAKU-TOOL® CC/CB-6503 has a fine surface with no bonding lines, as well as good dimensional stability. The models were used to produce lay-up tools with low temperature prepregs in the autoclave. The autoclave process allows for very high mechanical properties and a very high quality of the finished parts. A further advantage: RAKU-TOOL® CC/CB-6503 is delivered as a three dimensional casting, which is already a close contour of the customer’s final model and therefore easy and quick to machine with little waste. The nose of the racing car was produced using RAKU-TOOL® Close Contour Paste CP-6131 for medi-um temperature prepreg lay-up tools. Customer demand required that up to 120 parts could be produced from the same tool. RAKU-TOOL® CP-6131 is easy to process and apply. The quick and even heat dis-tribution within the shell tool guarantees fast autoclave cycle times. 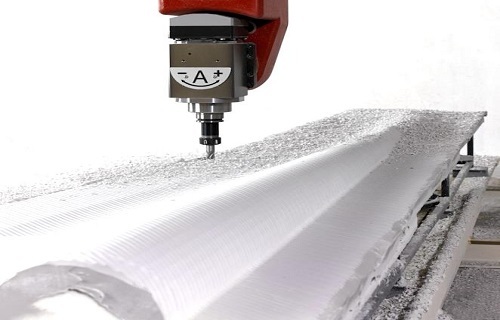 The production process is very fast and efficient – direct tooling does not require the production of a model, and the close contour shape facilitates faster milling times. Furthermore, as with all close contour products, less material is used and thus less waste produced. “With RAKU-TOOL® CC/CB-6503 and RAKU-TOOL® CP-6131, we were able to deliver a quicker, more cost-effective, and higher quality solution to produce the composite parts for the GP3/16 racing car,” Jochen Reiff, Sales & Marketing Director at RAMPF Tooling Solutions, describes the successful collabo-ration with Dallara Automobili. RAMPF does not just provide fast-tracked solutions on the ground: RAKU-TOOL® CP-6060 Close Con-tour Paste was used for the production of a wind turbine blade model to manufacture wind turbine blades using the composite construction method. The material is especially suited for the production of large models and molds in the wind energy, marine, and automotive industry. RAKU-TOOL® CP-6060 is easy to process and apply, even on vertical surfaces without slump. It can be processed after just 24 hours of curing at RT. RAMPF Tooling Solutions offers several different solutions and processes to produce excellent products. For the production of a carbon model of a sports car, various epoxy systems for three different compo-site construction methods can be used. What they all have in common: the end product is of the highest quality.